The Psychogenealogist Pic of the Week (#66) - "I am very weak, wood is very expensive and hard to find." 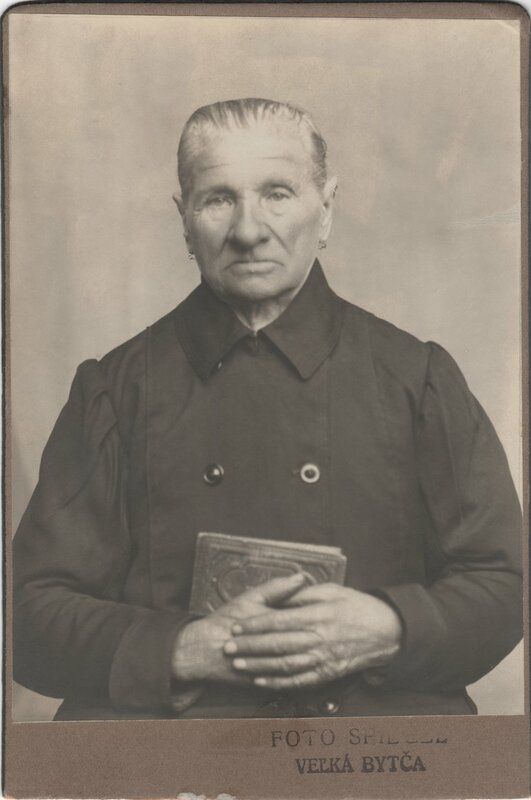 I found this stunning cabinet card photograph of an elderly woman. The photo is in excellent condition, despite being dated as 1931. I was particularly drawn to the very clear inscription on the back, albeit in a language that I neither recognized nor understood. This woman has seen some stuff. I wanted to know her story. My first guess was that the language was Polish. I turned to my Polish genealogy expert friend, Ceil Wendt Jensen. She informed me that it was not Polish (apparently Polish doesn't have the letter "v") but she wasn't sure which language it was. She suggested that I post it in the Genealogy Translations Facebook Page. One helpful member of that group recognized the language as Slovak, but was unable to provide a translation. Though this Facebook group has been very help on other occasions, I was not able to find a volunteer able/willing to complete this translation request. God Bless in Jesus Christ. 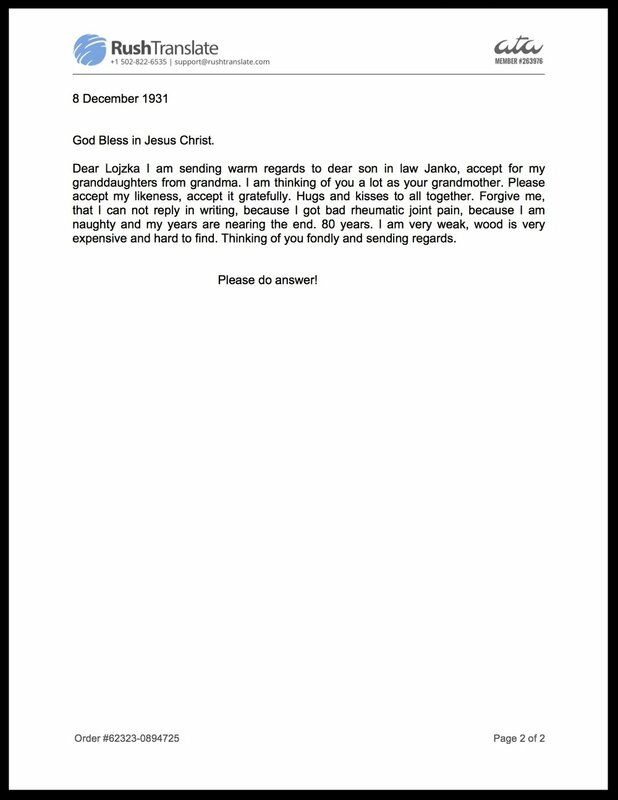 Dear Lojzka I am sending warm regards to dear son in law Janko, accept for my granddaughters from grandma. I am thinking of you a lot as your grandmother. Please accept my likeness, accept it gratefully. Hugs and kisses to all together. Forgive me, that I can not reply in writing, because I got bad rheumatic joint pain, because I am naughty and my years are nearing the end. 80 years. I am very weak, wood is very expensive and hard to find. Thinking of you fondly and sending regards. Here is the actual document that they sent me. Here is a short video rendering I made of this story several months after the original post. Both tragic and beautiful, the note this woman wrote to her family matched the mood that her face and hands conveyed. She is both mournful and resigned. Life is hard. It has always been, but especially so now when she knows her remaining days are few. Her exclamation, "Please do answer!" is both frantic and hopeful. She would like to hear from her family, especially her granddaughters, before it is too late. Is Lojzka her daughter, or one of her granddaughters? It is a little unclear. Janko appears to be the son-in-law. What is his story? She apologizes for not being able to reply in writing. Did someone write this message for her? The handwriting looks cleaner and crisper than I would imagine for an 80 year old woman with rheumatic joint pain. She said her being "naughty" was the reason for her joint pain. What does this mean? Where is she writing to? Why was wood expensive and hard to find? How in the world might I find a relative living today who might know this woman or the family she was writing to? If you have any ideas please post a comment below or send me an email. I would love to hear from you!